Casablanca is arguably the greatest film from Hollywood's Golden Age to ever grace the screen. 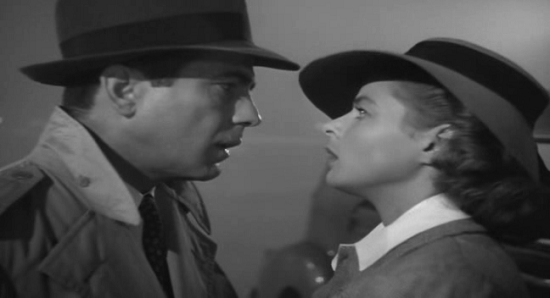 There’s a reason why everyone loves Casablanca. It has every element of a great film: Star-studded cast (Humphrey Bogart, Ingrid Bergman, Lorre, Henreid, Greenstreet), mystery, music, drama and romance. No wonder the film won the 1943 Oscar for Best director and Best motion Picture. One of the most beloved American films, this captivating wartime adventure of romance and intrigue is set in early December 1941 during World War II. Simply put, it is the story of Rick Blaine (Humphrey Bogart), a world-weary ex-freedom fighter who runs a nightclub in Casablanca during the early part of WWII. Despite pressure from the local authorities, notably the crafty Capt. Renault (Claude Rains), Rick's café has become a haven for refugees looking to purchase illicit letters of transit which will allow them to escape to America. 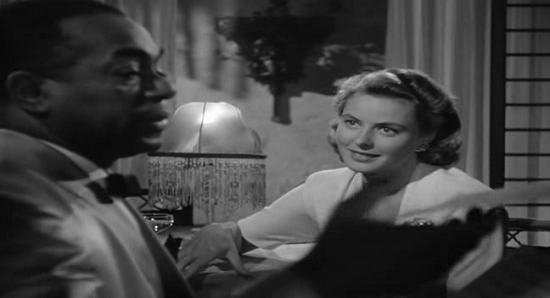 Everything changes when into his joint walks Ilsa Lund (Ingrid Bergman) and her husband Victor Laszlo (Paul Henreid), a renowned Resistance leader and idealist. A fugitive who has escaped a Nazi concentration camp, he is seeking “letters of transit” which would allow him and his wife to leave for America where they can continue his patriotic work. 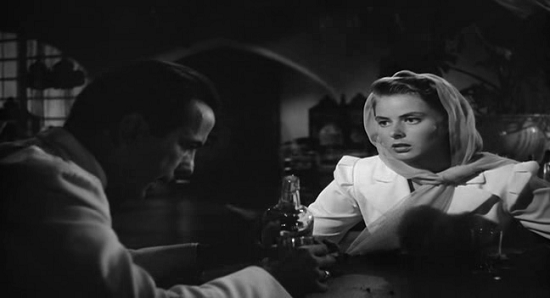 Ilsa Lund happens to be surprisingly Rick's true love who deserted him when the Nazis invaded Paris. 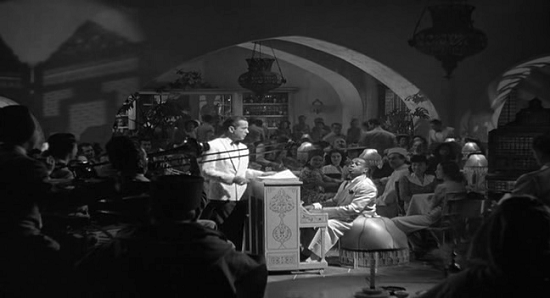 A shaken Rick (Humphrey Bogart) mentions to Sam, the piano player: "Of all the gin joints in all the towns in all the world, she walks into mine”. 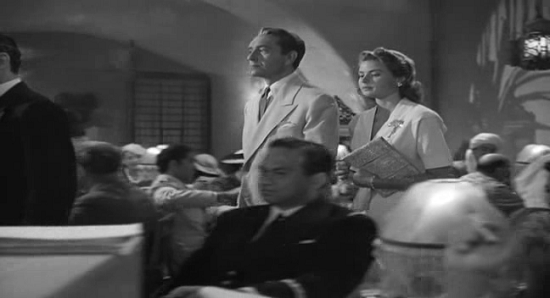 She still wants Victor to escape to America, but now that she's renewed her love for Rick, she wants to stay behind in Casablanca. "You must do the thinking for both of us," she says to Rick. He does, and his plan brings the story to its satisfyingly logical, if not entirely happy, conclusion. And Rick tweets another famous line: “"The problems of three little people don't amount to a hill of beans in this crazy world". The characters elevate Casablanca to the very epitome of supreme sentiment. 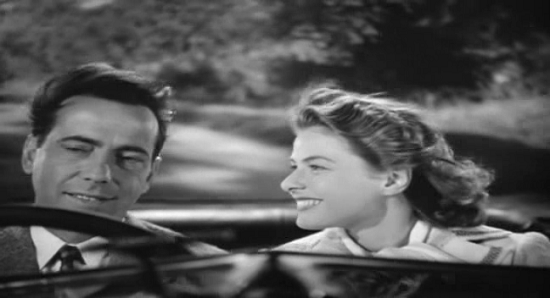 Humphrey Bogart, Ingrid Bergman and Paul Henreid form a love triangle that consistently engages the emotions from beginning to end. One can almost see themselves in the narrative structure. It’s a film about falling in love, making difficult choices, and doing what’s right. Despite Bogart’s stated indifference, his actions betray some profound feelings. Ingrid Bergman is the woman torn between two lovers, but with a detached personality that’s a bit challenging to read at times. Claude Rains as Captain Louis Renault is a lovably amoral French official. As Vichy France’s prefect of police in Casablanca, he’s unscrupulous and corrupt, cooperating with the Germans who happen to be in charge. “I blow with the wind, and the prevailing wind happens to be from Vichy.” Yet his friendship with Rick appears sincere. Renault shows signs of being a decent man at heart. Conrad Veidt portrays Major Heinrich Strasser with distinctive restraint as the chief Nazi villain and Victor Lazlo’s foil. It’s clear why this has become the standard by which all romances are judged. Casablanca is a script of Swiss watch precision. 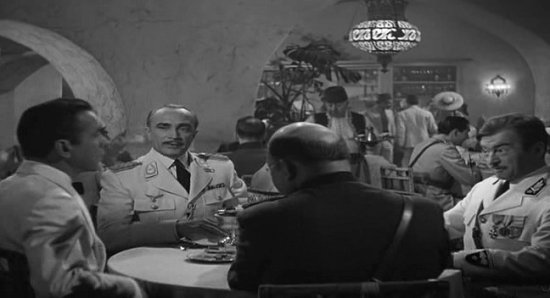 The great miracle about Casablanca is that it’s almost seamless screenplay was written, in effect, by a committee. It breezes by in a brief 102 minutes. Not a single moment is wasted, not a solitary misplaced word. It’s surprising that this drama set during World War II contains no battles, no extended fist fights, and no reliance on any physical action whatsoever. The one altercation that erupts in the bar is quickly ended by Rick. What we do have is one famous scene after another. Just try and not feel a tinge of French patriotism when the cafe patrons sing La Marseillaise drowning out the Nazi’s rendition of Die Wacht am Rhein. There are many unforgettable moments in the movie. 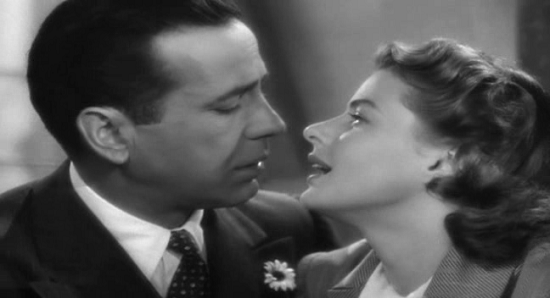 Who can forget that moment in '' Casablanca'' when Ingrid Bergman, carried away by passion, her eyes shining, surrenders her judgment to Humphrey Bogart and tells him that from now on he has to do the thinking for both of them? Another particularly memorable l scene is when some Nazi soldiers gather round the piano and sing an ominous song to the "Fatherland". It makes everyone in the Rick's cafe very uncomfortable. That's when Paul Heinried instructs the orchestra to play the French national anthem, the "Marseillaise". Everyone starts to sing. The Nazis are silenced. The music takes over. The music too is particularly memorable and apt. When, one evening Ilsa comes in to the cafe , on the arm of her husband Victor Laszlo, and asks the piano player to "play it Sam", he reluctantly plays "As Time Goes By." This melody which is played throughout the movie is the glue that defines the romance. "As Time Goes By" and, of course, "The Marseillaise," Max Steiner’s score gives an almost operatic quality to some of the scenes, particularly in the big confrontation scene mentioned earlier, in which Steiner actually has the Marseillaise sung in a musically effective counterpoint with the Germans’ song "Wacht aus Rhein." While playwright Bennett composed the original scene, Steiner made it a scene worthy of Verdi or Wagner. And who can forget Steiner’s amazing finale, as Rick and Louis walk off together to the stirring strains of the Marseillaise. Considering all, Casablanca is an unrepeatable triumph of art produced by a combination of luck, coincidence, and meticulous attention to small details.